Sling TV, the Internet-delivered, skinnied-down pay-TV service from Dish Network, is launching its first national TV ad campaign â€” telling consumers they should ditch their oppressive old cable and satellite providers. 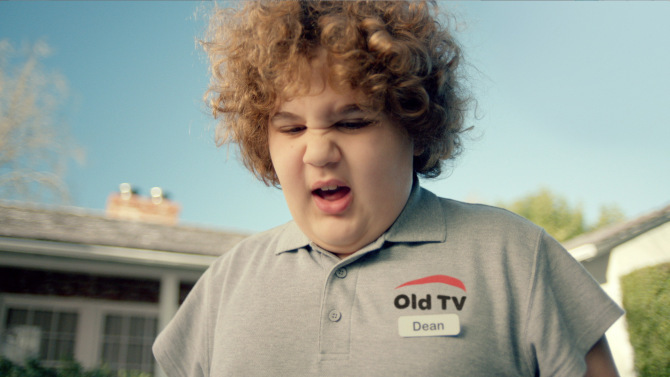 Of course, Dish itself is an â€œold TVâ€ provider, so the new campaign puts the No. 2 satcaster in the uncomfortable position of urging its customers to trade down to a cheaper, more consumer-friendly service. Why is Dish shelling out ad bucks to undercut itself? The unavoidable issue here is that thereâ€™s no way for Sling TVâ€™s anti-incumbent marketing message to stand out without the company also risking losing some of its 13.8 million satellite subs. The campaign, â€œDonâ€™t let your Old TV company push you around. Switch to Sling and take back TV,â€ promotes the over-the-top service that provides 20-plus channels starting at $20 per month as an alternative to traditional pay TV. Dishâ€™s strategy with Sling TV is to win over younger, cable-hating consumers who wouldnâ€™t have been in the market for satellite packages anyway. In the â€œTake Back TVâ€ spots, cable and satellite TV employees are portrayed as obnoxious children who verbally and physically abuse customers, giving them no choice but to accept long-term contracts, pricey programming bundles and lousy customer service. Naturally, Sling TV is aiming to slam cable operators and longtime nemesis DirecTV â€” indeed, the â€œOld TVâ€ polo shirts the tykes wear include a red swoop apparently meant to evoke DirecTVâ€™s logo. But Dish is pretty much the same old-style TV service, encumbered with the same restrictive pricing and terms. Asked whether the campaign could cut into Dish subscription levels, Sling TV chief marketing officer Glenn Eisen acknowledged the potential for cannibalization but said it has been minimal to date. And, echoing previous comments by Dish execs, he said Sling TV is reaching not only cord-cutters and cord-nevers but also pay-TV customers buying the service as a supplement. â€œWeâ€™re really reaching a consumer thatâ€™s going to grow the pay-TV industry,â€ Eisen said. Dish dropped a net 134,000 satellite-TV customers in the first quarter of 2015, blaming the decline on competition and programming disputes with Turner Broadcasting, 21st Century Fox and certain local TV stations. The company has not disclosed how many Sling TV customers have signed up to date, but on a call with analysts CEO Charlie Ergen claimed the vast majority did not previously have any pay-TV service. In addition to airing on TV, the Sling ads are posted on YouTube and the company will promote them via social and other digital channels. Eisen compared the spots to short â€œfilms,â€ designed in the hopes the campaign with go viral. Eisen added that he anticipates some TV networks will refuse to the air the ads; note that Sling TV doesnâ€™t offer any broadcast TV programming, either nationally or locally. But so far, no networks have rejected the spots. The campaign is produced by San Francisco-based ad agency Camp + King. Why does Charter think it can buy TWC when Comcast failed? After the huge deal between DirecTV and AT&T has died down from the airwaves, folks coast to coast are asking why Charter is making an aggressive offer for Time Warner Cable even when Comcast spectacularly failed just months ago with a humiliating defeat at the hands of the FCC’s chairman Tom Wheeler. After months of rumors, this morning it became official: Charter plans to step in where Comcast failed, with a $55 billion plan to acquire Time Warner Cable. Regulators looked unfavorably on Comcastâ€™s bid, finding it would have too many negative effects on consumers and on competition. But Charter clearly would not be trying its own takeover, with such a huge price tag, if they didnâ€™t think they stood a good chance of success. So what makes the second offer so different from the first â€” and is it any more likely to succeed? Charter CEO Tom Rutledge said in a call this morning, â€œWeâ€™re a very different company than Comcast, and this is a very different transaction,â€ which is true. But a few big differences, in this case, might just add up to â€œacceptableâ€ in the eyes of the FCC and Department of Justice. Had Comcast and Time Warner Cable merged and completed their three-way customer handoff, new-Comcast would have remained the industry leader with 30 million customers and Charter, through GreatLand, would have picked up an extra 2.5 million. But of course, that didnâ€™t happen. This merger, however, might. Charterâ€™s arithmetic, which includes business customers, says that the transaction will give the new Charter a combined 23.9 million customers in 41 states. Even using the residential customer numbers above, however, the combined company would easily have over 20 million customers. And either way you shake it, that puts them right in a competitive 1-2 situation with our existing dominant player, Comcast. If the TWC and Bright House acquisitions go through without spin-offs or concessions, that would make the new cable landscape look like fairly stronger in Comcast’s favor. Charterâ€™s reasons for wanting to spend a ludicrous amount of money on this deal, then, are pretty clear cut. The new company would vault from the middle of the pack to the head, suddenly becoming a force to contend with. The only company larger would be the still-pending merged AT&T/DirecTV â€” and they would exceed Charter in video customers, but not broadband ones.